To watch athletics inside the newly built Kalinga Stadium on Friday is akin to taking a pilgrimage. 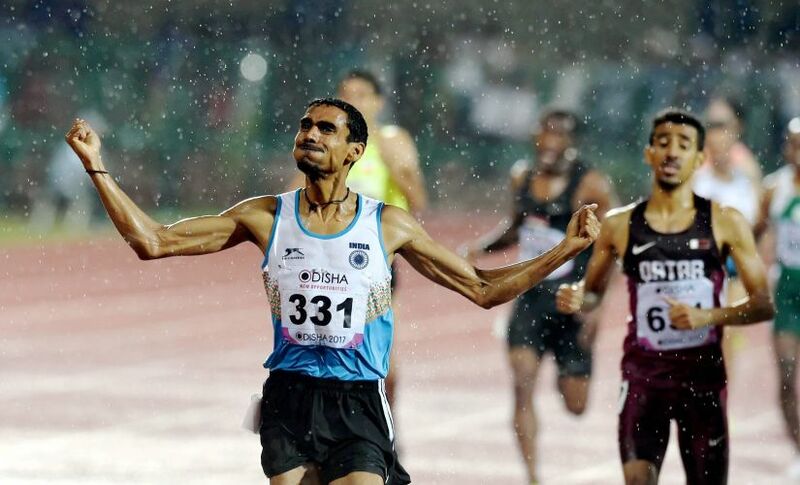 Close to 10,000 fans crammed in to watch Dutee Chand run the 100m semis and those who stayed back for the sprint final saw the emergence of new deities as these young stars set fire to a rain-drenched tartan track. Nirmala Sheoran and Muhammad Anas powered their way to 400m golds while Ajay Kumar Saroj and then Chitra PU stunned the stadium with gold medals in the 1500m; 4 golds on the day for a total haul of six gold, three silver and six bronze and there is still two days of action to come. 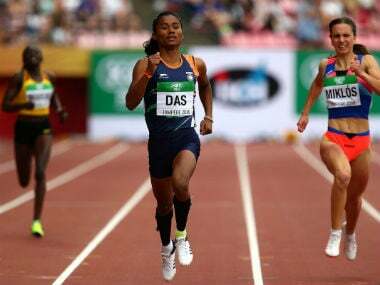 Dutee Chand had walked off finishing second in her 100m semi-final; a tight finish with Kazakhstan’s Olga Safronova who took first spot with 11.52 to the Indian's 11.56. In the distance, dark clouds rolled in from the West. The wind picked up and the various national flags hanging from the edge of the stadium roof swept back to the top as the gale picked up. Under the back drop of the lights, the rain seemed like a thin shower. And then huge droplets came out of the sky and within minutes most of the events had to be stopped as athletes took refuge under the field umbrellas and canopies across the ground. It was in these circumstances that the women’s 400 metres was announced, postponed, announced again as the athletes looked frazzled and frustrated with the delays; more so they had to warm-up, focus and suddenly they were back under the umbrellas. Finally, when the rain had reduced to a drizzle, the athletes were once again crouching on their starting blocks. Sheoran who had powered her way to the gold and a London spot in the Federation Cup was in lane 3; 2015 AAC silver and 2014 Asian Games bronze medalist MR Poovamma in 4; and Jisna Mathew in lane 5. At the 100m mark, the competitors still cussed each other out and by the time the group which also included Quach Thi of Vietnam went past the 200m, Sheoran was powering ahead, in her customary style, body titled to the left as her hands worked powerfully. The fans got into the act at the 200m mark, egging on the Indians for a sweep. Mathew narrowly took the bronze at 53.32 with Poovamma in 4th spot with 53.36. Meanwhile, Muhammad Anas was back on track to run his 4th race in two days. In the morning, he had run the 400m semi-final once again due to a faulty start the previous day. With Arokia Rajiv and Amoj Jacob in the mix, this was one of the most exciting 400m race in recent times. Jacob had beaten both recently in the Federation Cup but the youngster didn’t have the experience of the big stage. Anas had already qualified for the World Championships and taking the gold meant the order was not be disturbed. At the 200 metre mark, the three Indians were bunched up and Anas slowly pulled away as they came into the straight. Open chested with large strides Anas went for the finish line as Arokia did his best to keep up but there was no denying Anas. In the battle for the bronze, Jacob was beaten by Oman’s Mubarak Ahmed; 46.49 to 46.50. Jacob, a Delhi youngster has a smooth running style and if coached properly has the potential to be a future Asian Champion. “I was very tired,” said Anas, barely able to talk after the race. Gulping in air, immediately after the race, Anas was happy that in the circumstances where he ran a semi-final in the morning, he could pull off a win in the final. “My preparations are all keeping the 2018 Asian Games in mind but in London I want to run faster and see how much I can lower my own timing.” The best Asian timing of 43.93 is with Youssef Ahmed Al-Masrahi of Saudi Arabia set at Beijing in 2015. Nobody realized that the most fascinating race was around the corner when the 1500 men’s group assembled at the start. Mohammed Othman was the favourite with two Asian Championship and one Asian Games title under his belt. India’s Ajay Kumar Saroj was supposed to challenge but the best Indian track minds would never have picked Saroj as a winner. At the half way mark, five of the runners were bunched together with Saroj in the group, tightly stuck in the middle. The crowd was getting into the race, enjoying the jostling that happens in a 1500. For the Bhubaneswar fans, seeing an international athletics meet has whetted their appetite and they were on their feet as Saroj started pushing the group. At the bell, he was stuck to the side as Othman took the lead and didn’t let him pass from the outside. But three large strides and a quickened pace saw the Indian get past the group, take the lead on the straight and riding the roar of the crowd, sprinted to the finish, reminding one of the great Said Aouita, one of the greatest middle distance runners. Aouita always hid himself in the group, sprinting towards the end, decimating the opposition. The slight jump and a clenched fist at the end signaled Saroj’s triumph as he qualified for London with gold at The Kalinga. It took quite some time for the fans to settle down as the stadium throbbed with the excitement and energy of the 1500m race. Saroj clocked 3:45.85 while Asian Champion Othman finished 7th. “I will try and learn from others at the World Championship,” Saroj said excitedly. “All this happened because we were already in the planning and preparations for the 2018 Asian Games.” Saroj also hopes to meet his idol David Rudisha, the 800m Olympic Champion in London. Just as the excitement died down, fans got another treat - a gold run by Chitra PU who pulled off probably the most unexpected win by blowing away the opposition in the women’s 1500. Cruising through the race with an easy style, she picked on the crowd’s energy, tearing away in the end to the surprise and shock of China’s Geng Min and the two Japanese athletes who trailed in 3rd and 4th spot. All through this the drizzle continued but by now with their appetite whetted the crowd waited for the 100 m final; the big-ticket event of the night. Dutee had been second in the semi-finals and it would have taken some doing to beat both the Kazakhs. A false start removed Japan’s Mizuki. By the 50m mark, Dutee was in with both Viktoriya and Olga but the tall and powerful Kazakhs pulled away as the Odiya sprinter finished a creditable 3rd with 11.52. With all the excitement on the track, India’s Tajinder Pal Singh Toor picked up silver in the men’s shot-put with an effort of 19.77. Iran’s Ali Samari took the gold with 19.80. Unfortunately, the men’s 100m was run as the fans were leaving, slightly disappointed with Dutee’s bronze and after two false starts, Iran’s Hasan Taftian caused the biggest upset winning the gold in 10.25; the favourite, Femi Seun beaten into second spot with 10.26. Taftian trains in France and said this was Iran’s first ever gold in an Asian 100m final. “It’s my greatest day,” he said. “And now I will be in the semi-finals of the world championships.” The night melted away as the rains drenched the track and the fans alike. In the cauldron, The Kalinga, the mesmerizing romance of track and field endured.